This method is designed to modify neighboring pixels in a single Landsat 7 SLC-off scene, creating a final aesthetic image only - no scientific analysis accuracy is guaranteed using this method. This method was designed using ERDAS Imagine 2014™*, along with ENVI™* or Adobe Photoshop 2017™ * for final filled-image verification. The approximate time to complete a scene is 20 minutes. Questions about this method can be sent to Customer Services. 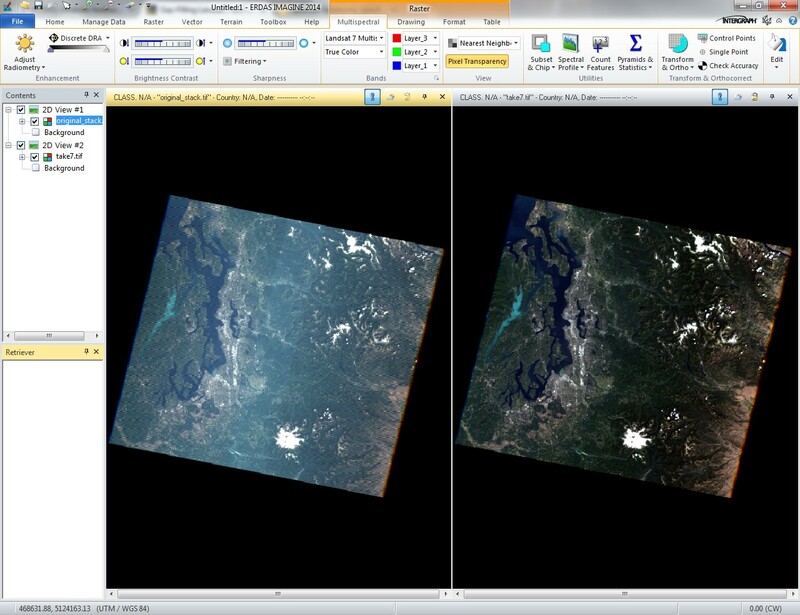 Download and extract the Landsat 7 SLC-off image that will be used. Within the directory of the downloaded scene, create a new folder titled "Bands." Click OK. The Modeler will create a new layer stack. This process should take about 1-2 minutes. *To gapfill panchromatic Band 8, follow the above steps, only using Band 8, saving with "_pan.tif" to differentiate between the multispectral files created. Choose the original_stack.tif file created in Process One as your Input File. For you Output File, use a name that will designate the first pass of filling (ex. take1.tif). 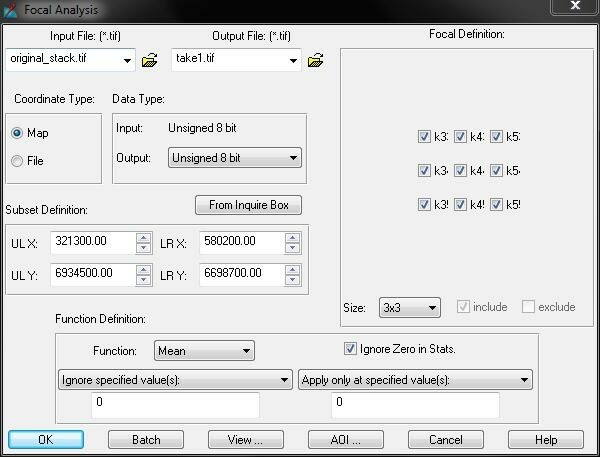 From the Focal Analysis Tool, change Data Type Output to "Unsigned 8 bit". In the Function Definition section, make sure Function is set to "Mean" and the "Ignore Zeros in Stats" option is checked. Click OK. The Modeler will run the first pass of filling. This process should take 1-2 minutes. When the process shows "DONE", click Dismiss and Close. After completing Process Two, it is important to compare pre- and post-filled imagery. ERDAS can be used to view both the original data stack (original_stack.tif) and the final gap-filled file (take#.tif). In the 2D View window, select the Open Raster Layer Icon and open the "original_stack.tif" file. 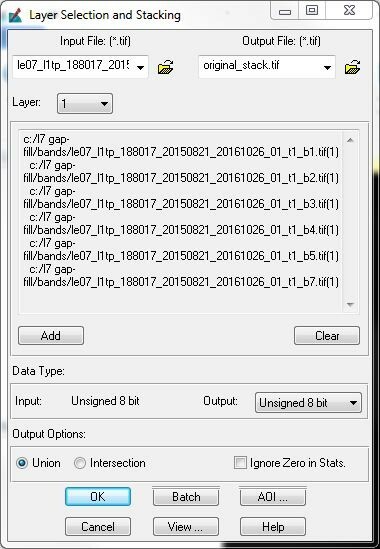 Select File --> New --> 2D View, then select the Open Raster Layer Icon and choose the final gap-filled file (take#.tif). Select which bands to display in the Red, Green, and Blue channels from the Multispectral tab to match the bands selected in Step 2. From the Multispectral tab, select the bands you would like to display in the Red, Green, and Blue channels that match the "original_stack.tif" image from Step 2. Right-click on your 2D View Layer in the Table of Contents and choose "Blend", "Swipe", or "Flicker" (Figure 6). These options toggle between the two images using different transition types to highlight the changes between the original data stack and the final gap-filled image. Photoshop can also be used to create a final image for use. 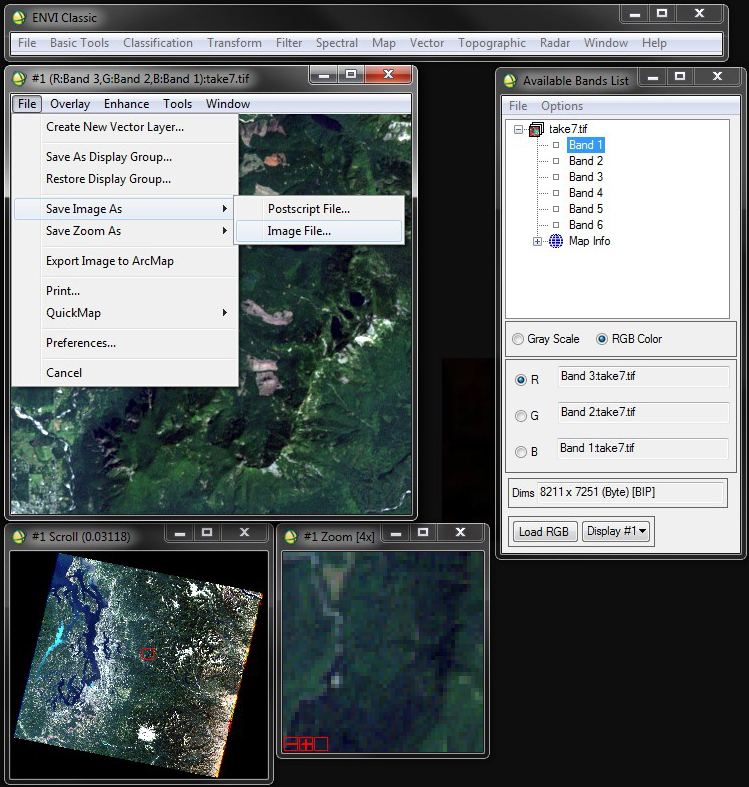 However, using this method will not create a georeferenced image. See Section Five for using ENVI to create a georeferenced final filled image. Open the latest "take#.tif" file in Photoshop. The file will open as a grayscale stack. 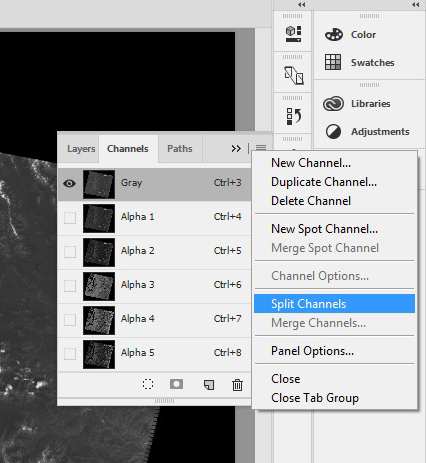 To create a color composite, select the Channels tab again, expand the extra options, and choose Merge Channels. The Merge RGB Channels box will appear. Specify which bands you want to occupy the Red, Green, and Blue Channels. 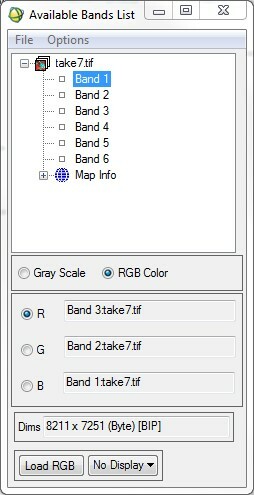 *Band 1, by default is set to the "take#.tif_Gray" band. Band 2 will be "take#.tif_Alpha 1", Band 3 will be "take#.tif_Alpha 2", and so on (Figure 9). Click OK and the resulting image should be a color composite using the specific bands you selected. In the Available Band List box, the individual bands will be displayed (Since Band 6 was not included intiially, Band 7 is called Band 6 in the list). Click Load RGB to display the filled image in the desired RGB channels. When the desired RGB composite is achieved, select File on the Image display box and choose Save Image As --> Image File. Make sure the Output File is TIFF/GeoTIFF and click Choose to navigate to the correct directory to save the final .tif image. Click OK. (A .tfw file will also be created that contains the georeferencing information).